Last Updated: April 3, 2019 · Published: May 30, 2016 By: Asian Caucasian Leave a Comment This post may contain affiliate links or sponsored content. Don’t shy away from Asian fried rice because you think it’s too fattening! This super healthy version will have you asking for extra helpings! It’s made with riced cauliflower instead of rice, but you wouldn’t know the difference. 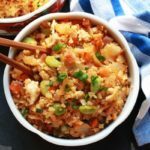 The unique Kimchi flavoring gives it a nice zest, and the addition of pancetta elevates the flavor even more! This recipe is great as a side dish or as an entree. Dig in fellow foodies! Heat a large wok over medium heat and spray with cooking spray. Add the pancetta and cook until browned. Move pancetta aside to a small bowl. Add the sesame oil to the hot wok and sauté onions, garlic, and carrots, about 3 to 4 minutes, or until soft. Add in the chopped kimchi and kimchi juice. Cook another 3 minutes. Raise the heat to medium-high. Add the cauliflower “rice” and edamame to the wok along with soy sauce. Break up the cauliflower with a spoon, cover and cook until well incorporated, around 5 to 6 minutes. Push the vegetable mixture to one side of the pan and add the beaten eggs and green onions to the empty side. Scramble eggs until cooked through. Add the pancetta back into the mixture. Taste, and adjust seasonings with more soy sauce or kimchi juice. Garnish with remaining green onions and sesame seeds. Notes: You can purchase frozen riced cauliflower at Trader Joe’s and other select grocery stores. Kimchi can be found at your local grocery store in the produce section.